I came across falafel chips in Trader Joe’s when I visited San Francisco last year. Not knowing where to buy these here in Canada, I decided I had to come up with a recipe for them, and even considered starting a falafel chip enterprise. Recently, while still trying to work on my own recipe, I came across another brand of falafel chips in a general store in Sydenham, Ont., so my idea of commercialising my own was dashed. Nonetheless, I am pleased that someone else is doing it, even if they are imported. They are made by a company called ‘flamous’ (sic) and are sold as Falafel Chips. Even if you can buy these, or the ones from Trader Joe’s, you might be interested in making them yourself. They are cheaper, fresher, and you can alter the recipe to your own taste and according to what is available. They are excellent on their own, or served with hummus, guacamole, or whatever you fancy. The recipes I have come up with are not so much recipes as ‘a method’. 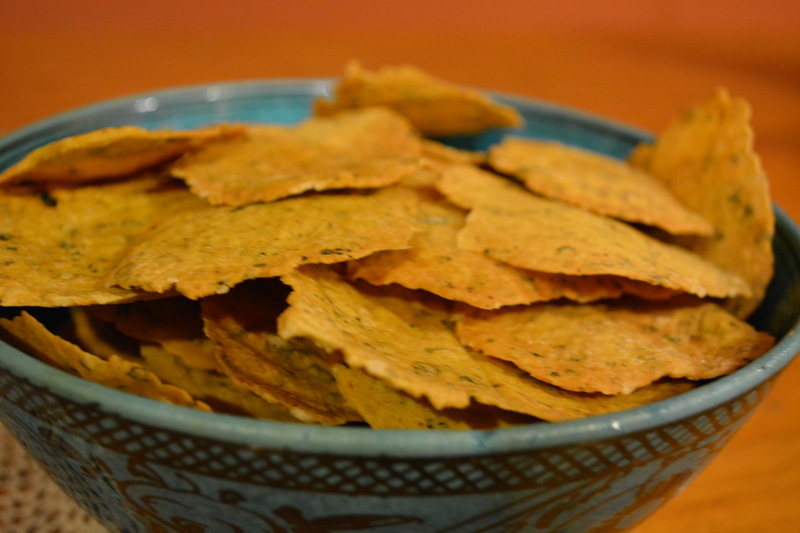 As long as you have chick pea flour (besan) cumin and water, you can make these. You only need to make sure the dough is not too sticky but sticky enough to stick together. 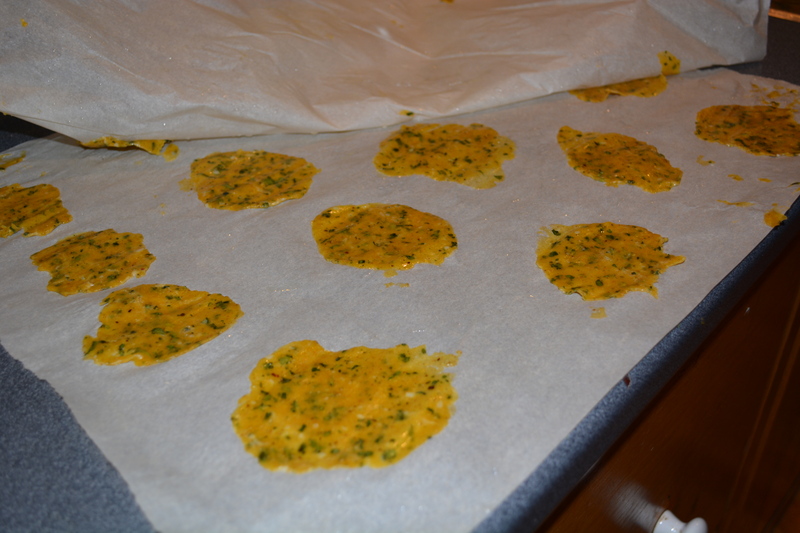 The method of rolling them out is suprisingly simple, as long as you remember to oil the parchment paper. Sometimes I add oil, sometimes not, it seems to make little difference. The more herbs and spices you add, the more complex the flavour, so feel free to come up with your own variations. 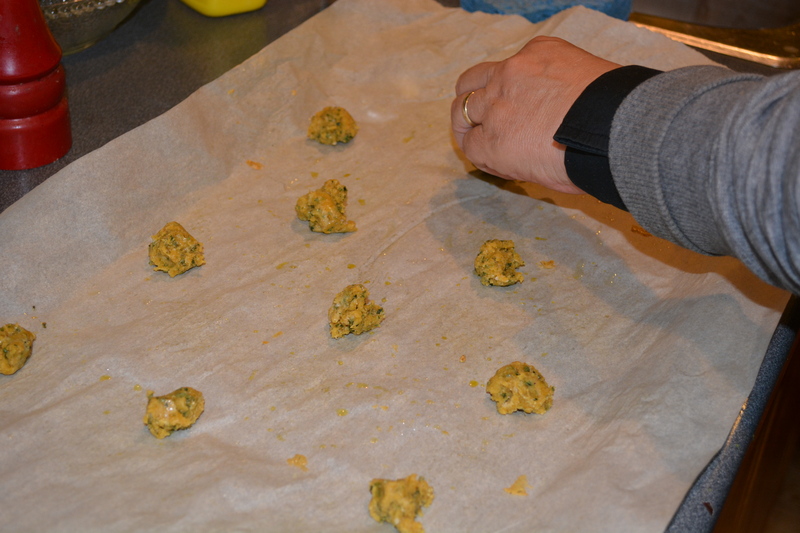 The first recipe contains dried dandelion leaves, which give them those green speckles, and the second one contains tomato paste and some cornmeal. Mix together all the dry ingredients. Add water until the mixture holds together, but is not sticky. Lightly grease two sheets of parchment paper and put small dobs (about the size of a grape) of batter spaced about 2 inches apart. 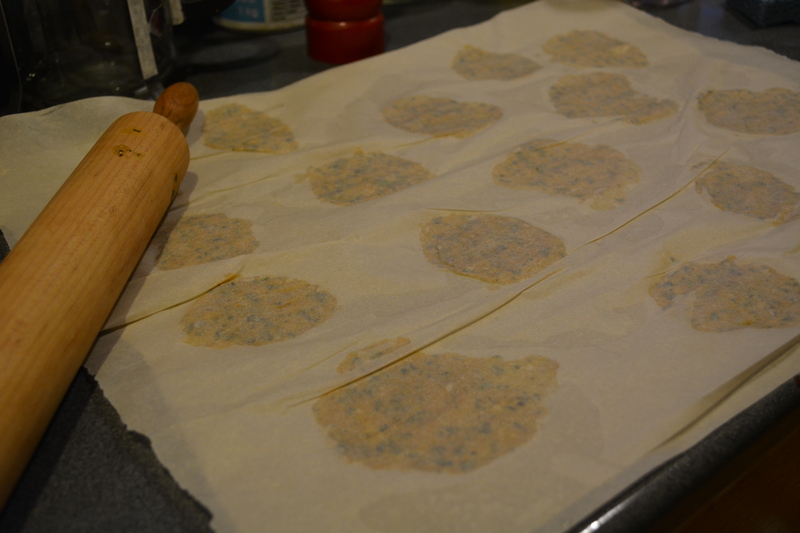 Place the other piece of parchment over this, and roll out with a rolling pin, until the chips are thin enough that when touched with your finger, you can feel the hard surface below.There should be no squishy feeling of the dough. Peel off the top layer of parchment, place the chips, still on their paper, on a cookie tin, and back in a preheated oven for 20 minutes at 275 Fahrenheit. The chips should be an even gold colour. Store in a container with a tight-fitting lid to keep them crisp. Follow the same procedure for the first recipe. Categories: recipes, snacks | Tags: chips, cornmeal, dandelion greens, edible flowers, falafel chips, foraging, gluten free, healthy snack, organic, snack, vegan | Permalink. 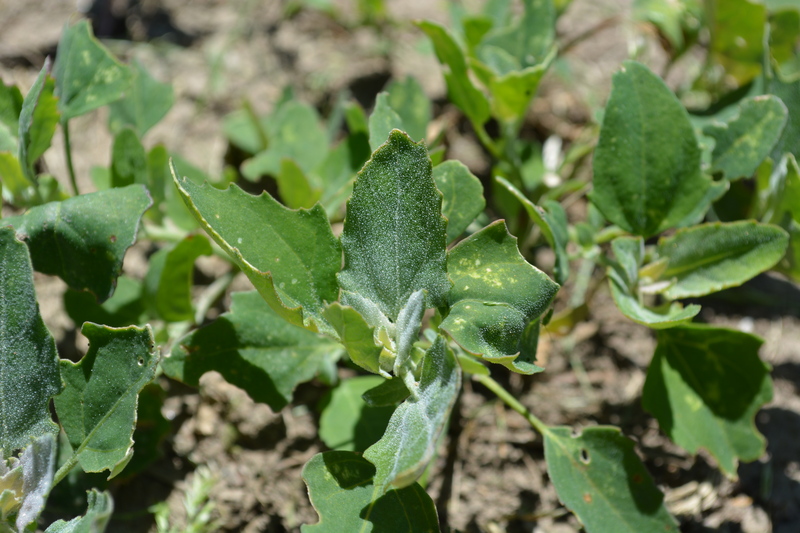 Chenopodium album, meaning white goose foot, related to spinach, rhubarb, beets and chard, known as lambsquarters, pigweed and a number of other names, grows in all gardens in this area – anywhere that soil has been turned. Of all the weeds I pull in my vegetable and flower gardens, fully half of them must be this weed. So if cleaning your garden means you have some healthful and tasty vittels for dinner, you kill two birds with one stone. Like so many overlooked wild plants, this one is full of good stuff: niacin, folate, iron, magnesium and phosphorus and, even more, dietary fibre, protein, vitamins A, B6 and C, thiamin, riboflavin, calcium, potassium, copper and manganese. If you are still not convinced that this is worth eating, it is a great substitute for spinach, at no cost, and if you pick it in an unpoluted garden free of chemicals and contaminants, probably better than spinach. If you know how to cook spinach, there is no real need for recipes. Young shoots can be used in salads, and as the plant ages, just pick the leaves off the sturdy stem (discard any blemished ones), rinse well and use as you would spinach. This recipe I am sharing is one that requires a little more effort than sauteing or steaming, but I think highlights the rich green colour and delicate flavour of the plant. It could also be made with rice, as you would a risotto. If my pictures are not enough to help you identify it, there are plenty of pictures and descriptions available on the internet, and if you are still not sure if you have it in your garden, check with someone familiar with local weeds – there must be one somewhere near you. 4 cups lambsquarters, leaves only. Heat the oil in a saucepan and fry the onion until soft, but not browned. Add the barley and fry for a couple of minutes, being sure to coat all the barley with oil. Add the garlic and fry for another minute. Stir in the herbs, salt and grated lemon peel. Pour 1/2 cup of the water or stock and stir the mixture occasionally until most of the water has been absorbed. Continue to add water, 1/2 cup at a time. When the last addition of water is made, add the lambsquarters and mix well until there is no more liquid visible. 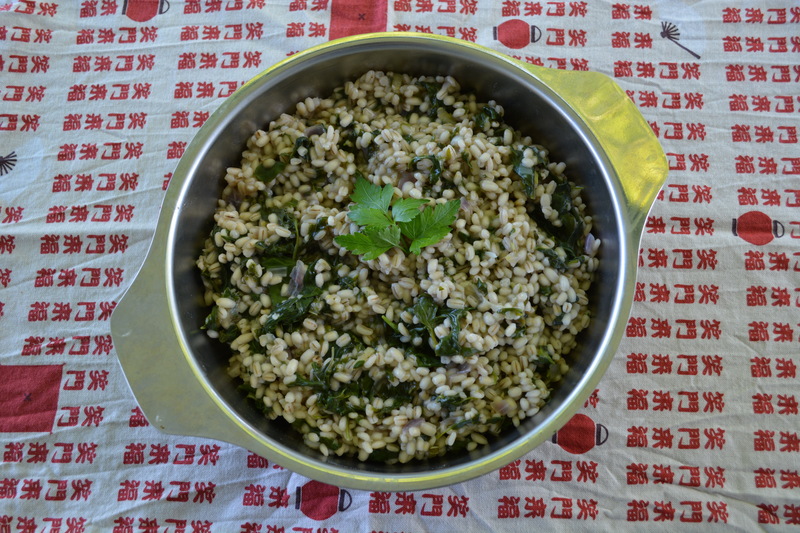 Categories: edible weeds, garden vegetable, recipes | Tags: barley, chenopodium album, foraging, lambsquarters, recipe, risotto, side dish, vegetarian, weeds | Permalink. Here is a soup which can be served hot or cold. It makes an elegant and inexpensive dish at this time of year. I added the pomegranate molasses to add a little red colour, and found the flavour goes well with the spices, but if you don’t have any, it can be omitted. Mix the first five ingredients together in a saucepan, bring to a boil and simmer for half an hour. Strain the mixture through a fine sieve and discard the pulp. Add the sugar and stir over medium heat until it dissolves. Mix the cornstarch in some water and add to the mixture. Add the yogourt, heat but do not boil. Categories: recipes | Tags: rhubarb, soup | Permalink. Rhubarb is not a wild plant, but once you have it, you have it forever. Mine was a good healthy plant when I moved to my current property almost three years ago, and it just keeps getting bigger and better. This may be the first year I can’t keep up with it – I use it for desserts, chutney and soups, and I freeze a good deal of it for the winter just by chopping it and storing it in the freezer in plastic bags. And if you like mixing your rhubarb with strawberries for pies, you might want to try other sweet fruits, such as apricots, blueberries, seedless grapes or dates. This is a basic stewed recipe which, with minor alterations, can also be jam or filling. I used fresh ginger for flavouring, but vanilla, orange blossom or rosewater are also really good. This can be used for filling tarts, thumbprint cookies etc. Mix the first three ingredients in a bowl and let sit overnight or several hours, until the sugar has become all liquid. At this point, add the cornstarch. Bring to a boil and then simmer for a few minutes, until the rhubarb is just tender, but not mushy, and the liquid has become translucent. Once cooled, fill baked tart shells, cookies etc. Do as above, omittting the cornstarch. Same as for the stewed rhubarb, but continue to cook until it is a thick consistency. Categories: dessert, recipes | Tags: desserts, fruit preserves, jam, rhubarb, storing rhubarb, tarts | Permalink.